Hi, M A Martin, Duff has a good idea. I did an Ebay search for "Junior Sales greeting cards" and it returned a whole bunch of hits. See if one is right for you. For convenience here's the eBay link. In 1978 my son sold greeting cards for Junior Sales Club of America. That Christmas there was a card in the book containing the specialty cards that I absolutely loved. I was only able to buy one box but promised myself that the next year I would buy more. It was never available after that year. That card was on sepia toned paper with a metalic etching of Christ in the Garden of Gethsemene on it and the inside verse spoke of God's greatest gift and had John 3:16 on the bottom of the side opposite the verse. I know it was not very "Christmasy," but it said exactly what I wanted a Christmas card to say. Is there any way I can buy one or more of those cards? 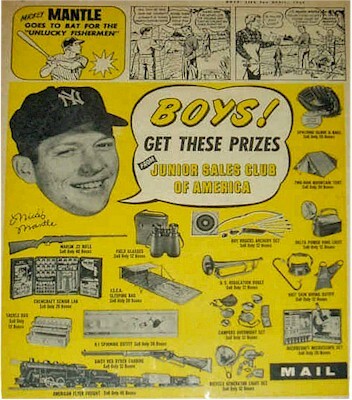 This company advertised in such publications as Boys Life, and had kids like me selling personalized greeting cards door-to-door to earn prizes. I actually managed to sell a few boxes of Christmas cards over the course of maybe three years, but I don't recall getting any prizes.